1. Newlyweds through romantic marriage: Yuway and his young bride, Warbwi. (Yuway’s clothes were given by Bruce.) Since husbands and wives seldom appear together as a couple in the village, and since marriage has little ceremonial recognition, it is surprisingly difficult to photograph Gebusi husbands and wives together in a spontaneous context. 2. 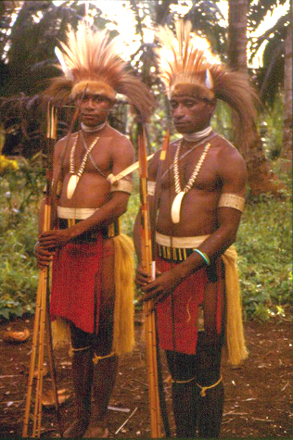 Two men stand in traditional costume prior to a ritual feast in a distant Gebusi settlement, 1998. In earlier decades, strong men who excelled in ceremonial life were often favored by women. Now, however, women often favor men who orient to modern activities in and around the Nomad Station.